Darjeeling, India | AFP | Friday 8/4/2017 – The world faces a shortage of prized Darjeeling tea because of deadly unrest in the idyllic Indian Himalayan foothills where it is grown. In the dozens of lush green plantations across the picturesque hill station, the June-August harvest season normally provides the bulk of the nearly eight million kilos of tea sold a year – most of which goes to Europe. But with a showdown between native Gorkhas, who provide the majority of plantation workers, and the West Bengal government now 50 days old, production fell by 90 percent in June. Tourism has also been badly hit by the dispute in which the main Gorkha group has halted harvesting and called for a shutdown of the tea industry. There have been predictions that prices could rise more than 20 percent and some Darjeeling tea gardens could take years to recover. Tea Board India, the government regulatory body, said only 140,000 kilogrammes (154 US tons) of tea was produced in June, a plunge from 1.3 million kilos in the same month last year. The history and distinctive taste have made Darjeeling one of the world’s most recognised food names. British officer Arthur Campbell started planting tea bushes in 1841 in Darjeeling before commercial plantation began in the 1850s. It is the only Indian brand with international protection, meaning that only tea grown in the region can be called Darjeeling. Specialty teas can sell for up to US$ 1,800 a kilo (US$ 820 a pound) while companies such as Indian conglomerate Tata and Unilever sell more mass-market varieties around the world. Clashes and arson attacks have rattled the hills since early June, shutting down businesses and schools, and forcing thousands of tourists to flee. Three people have been killed. Gorkha Janmukti Morcha (GJM) has been at the forefront of decades of agitation calling for a ‘Gorkhaland’ within West Bengal. They say Bengali-speaking outsiders have exploited their resources, and imposed their culture and language. Plantation owners say the blockade has severely affected the delicate tea bushes that have been overrun by weeds. “Tea bushes need regular irrigation, de-weeding and pruning. It will take weeks if not months to get them back in shape and then more time to start the production,” said Mittal. Gorkhas’ demands for a separate homeland started in the 19th century and have regularly erupted. Unrest in 1980 left nearly 1,200 dead. The latest flare-up started after the government ordered Bengali language lessons in state schools – angering ethnic Gorkhas who speak Nepali. At least three protesters have been killed in clashes. Government forces now patrol the streets of Darjeeling while the separatist group has set an 8 August deadline for their demands to be met. 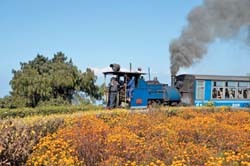 Protesters have targeted Darjeeling’s UNESCO-recognised ‘toy train’ – a 78-kilometre (48-mile) ride up from New Jalpaiguri. Two stations on the line were gutted in arson attacks. Plantation owners and traders say the deadlock is a catastrophe for the tea industry. They say agitators have threatened violence and barred outsiders from working in tea gardens. A further logjam will spike the commodity price and loss of business to rival brands that so far have failed to dent Darjeeling’s global fame. “If the situation continues like this, we might lose business to China, Sri Lanka and Nepal tea brands,” Lochan told AFP. He said traders fear huge damages demands if they fail to deliver consignments. Lochan said only 20-30 percent of production has been harvested this year.